United Student Government (USG) hosted its annual Meet the Candidates Night where candidates briefly outlined their platforms for the upcoming USG election. Four of the seven vice presidential candidates are running uncontested and one of the positions, Vice President of Sustainability, is currently accepting write-ins. The two contested positions are for Vice President of Gabelli and Vice President of Communications. Reilly Keane, GSB ’20 and Michael Tomicich, GSB ’20, both running for VP of Gabelli intend to better bridge what Tomicich’s platform referred to as a gap between students in the Gabelli School of Business and students in Fordham College Rose Hill. Keane, who live-streamed into the event from London, outlined her three campaign initiatives, including expanding student mentorship programs, expanding the Gabelli vision for prospective students and providing information that will aid students who are not in Gabelli’s most popular majors, including expanding research into less populated majors. Tomicich’s platform included a proposed mandatory service day intended to bring students together to help the Bronx community, a suggestion close to several of the candidates’ platforms. Carlos Rico, FCRH ’21, current senator running for re-election, campaigned largely on a platform that intends to weave together the Bronx and the university. Ashley Qamar, GSB ’20, vice presidential candidate for the executive ticket and current vice president of Student Life, echoed this sentiment when she stressed the importance of diversity and bias-tracking as co-chair of the Diversity Action Coalition. “There’s room for us to grow as a Fordham community and there’s room for us to grow as a Bronx community,” said Qamar. Qamar, who said she has become increasingly connected to students emotionally, is prioritizing inclusion. Kaylee Wong, GSB ’20, presidential candidate and current vice president of USG, repeatedly stressed that the university is at a pivotal stage for change and said as president she will continue asking questions to increase transparency. “It really seems that when we ask a question, they assume that students don’t care about it so I’m saying we do care about what’s going on so that they have to be transparent,” said Wong, addressing the question concerning systemic transparency at Fordham. Wong and Qamar’s plans for the upcoming school year include bolstering sustainability and Earth Week programming and collaborating with IT to address banner and OrgSync issues with the intention to make these systems more user friendly. Griffin LaMarche, FCRH ‘22, candidate for vice president of Communications touted his skills in photoshop and various programs while his opponent, Thomas Reuter, FCRH ’22, said his communication skills would allow his platform, based on transparency, expediency and accountability, to be successful. LaMarche called for increased freshman senate representation and the implementation of a Direct Streamlined Feedback (DSF) program to improve campus communication. He also proposed the replacement of OrgSync as the primary communicative platform and if not possible, increased tutorials for clubs to learn how to use OrgSync. Reuter said overhaul and a new program could be utilized as a replacement for OrgSync. “I think that scrapping that old program and coming in with a new program that advertises what USG is doing and what other clubs are doing on campus can be effective,” said Reuter. Several of the candidates addressed issues of exclusivity and elitism within USG. Nicholas Abbazio, GSB ’21, current senator running for re-election, called for an end to this supposed culture. One of Abbazio’s initiatives focuses on building a lasting relationship with Part of the Solution (POTS) where the university could donate excess food it would otherwise throw away at the end of each day. Luke Morgan, GSB ’22, candidate for senator, also said he wants to improve the elitist reputation of USG. In addition, Morgan proposed online access rather than paper copies be granted to Gabelli students in order to promote sustainability. FCRH Class of 2020 Senate Candidate Matt Schumacher, FCRH ’20, a current senator running for re-election stressed the importance of other clubs following USG’s lead in his speech delivered by Connor Sullivan, FCRH ’19, current USG president. “There are other organizations on campus who think they can do whatever they want…they are organizations for the people, like USG, and they should do as such,” wrote Schumacher. David D’Onofrio, FCRH ’22, current senator running for re-election, called for initiatives he referred to as smaller, but important, including putting tampons and other feminine products as well as tissues in campus bathrooms, coffee in the Walsh Library and allowing fruit to be sold for meal swipes. 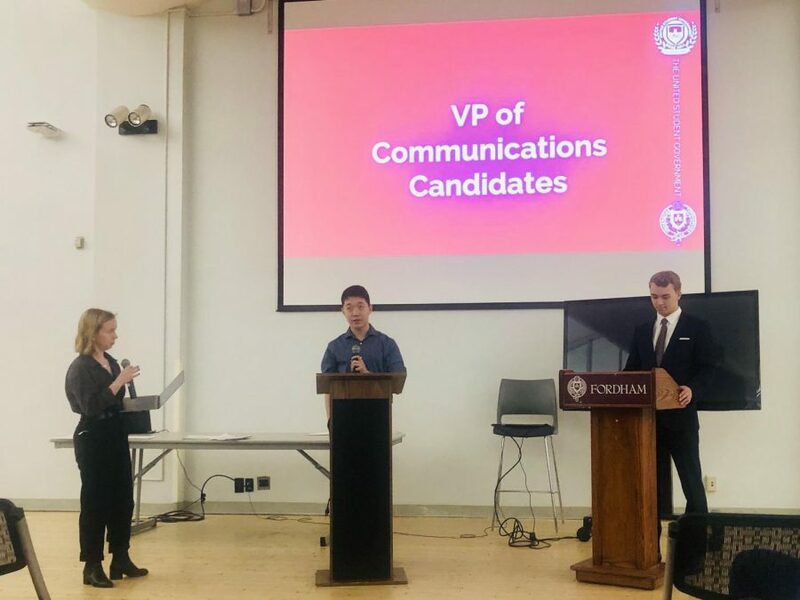 Patrick Fox, FCRH ’20, vice president of FCRH running for re-election, outlined his plans for a current proposal that would bring a career services class to Rose Hill students. Several candidates also addressed the importance of mental health and called for improved counseling and psychological services and resource awareness, including Emma Budd, FCRH ’20, vice president of Health and Security. “I want students to know I can be an open line of communication for public safety,” said Budd when addressing issues of student health and safety. Some of the candidates also called on the importance of fighting for transgender and non-binary recognition and safety. Tyler Raciti, FCRH ’21, recent transfer, outlined his platform for his Senate run. “As an LGBT individual, Fordham really struggles there and we have to admit that,” said Raciti. The vote for Vice President of Gabelli and Vice President of Communications opens at 9 a.m. on Wednesday, April 10 and closes at 5 p.m. on Friday, April 12.